Curtis Smith is a wonderful storyteller. As a writer of fiction, he has published two collections, The Species Crown and Bad Monkey. 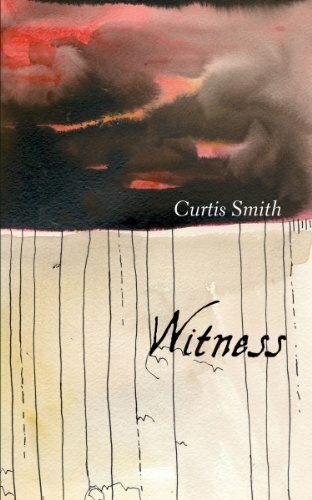 With Witness, we get the pleasure of experiencing Curtis Smith’s talent as a writer of nonfiction. His strong skills of observation are matched by his gift of language; and these personal essays vibrate with the beauty of a sensitive, creative intelligence. He reads the world much as a visual artist does, drinking it in with his eyes and heart; by the time he writes what he has absorbed, it has been alchemized into a kind of golden truth, archetypal and pure. Smith himself understands this, speaking in an essay about Diane Arbus: “An artist takes his obsessions and visions and turns them into fuel, a bit of alchemy no amount of gold can buy.” It is his own talent I am thinking of when I read those words. His position on what has happened to the no-longer-so-free press in the U.S. is disapproving, but clear-eyed. “Our leaders maintain the censorship of wartime reporting is necessary to protect the privacy of our soldiers and their families, but the hard reality is that the powers that be, wary of public opinion, have embarked on a quest to sanitize war, to remove its blood-and-flesh reality and make secret its tales of ruined lives.” As a writer so dedicated to unearthing the deeper truths of human experience, Smith’s lamentations about the failings of our country’s press are strong. As the pundits on either side of the political spectrum filled the airwaves, few were asking about those who really orchestrated this torture. “Word by word, the political and social machines forged the links that bound her to a crime in which she was the pettiest of players. None of us reached out to save her as she sank into the cold water. The ice reformed, a metaphor reinforced by her swift court martial and subsequent confinement in a military prison outside San Diego.” On the other side of the spectrum was the well-orchestrated story of Jessica Lynch, touted as a hero at the center of a dramatic military rescue mission. Her sweet, smiling yearbook photo was splashed across all forms of media. The story of her bravery was spoken about everywhere. Why does the failure of our press lay so heavily on Smith’s shoulders? Because he searches daily for the unseen connections, the mysteries deserving discovery. He doesn’t want to look away, and he helps his readers to maintain their own gaze through the beauty of his language. Watching the flight of a flock of geese, he comes to understand the plight of poverty experienced by the poachers who shoot them down. Poverty, in fact, is all around him. He sees it in the lives of his students, and struggles to understand how its grip can misshape them, hobble them. This is not the cold observant eye of a social scientist. Rather, it is the eye of the artist/teacher, struggling to learn how he might be failing his students, what he might come to do better. In an essay called “A Knife to the Heart,” Smith reveals his sorrow at losing a student, who drops out in his senior year, and who, we learn, is later knifed in the heart and killed. Teachers, Smith tells us, love tests; he understands that passion, but is not quite able to articulate his nagging fear that, as the educator, he may well have failed a test of his own where this student was concerned. Witness asks many of the right questions. But those questions often lead us to more complicated questions, the kind that challenge our deepest beliefs and illusions. Smith bears witness to life in all its pain and all its beauty. Mystery cloaks our lives, but in Smith’s essays, there is a fleeting glimmer, again and again, of a transcendent understanding, born in the longing of a very human heart, and presented through the talent of a very gifted writer.